Indian Institute of Technology, IIT Kanpur has released the mock tests for Joint Entrance Examination, JEE Advanced 2018. The mock test is available on the official website jeeadv.ac.in. The mock test for the computer-based test for JEE Advanced 2018 was released on December 19 by the IIT. The examination is scheduled for May 20, 2018. In order to facilitate the students who are preparing for the JEE Advanced 2018 examination, IIT Kanpur has released two additional mock tests for students. 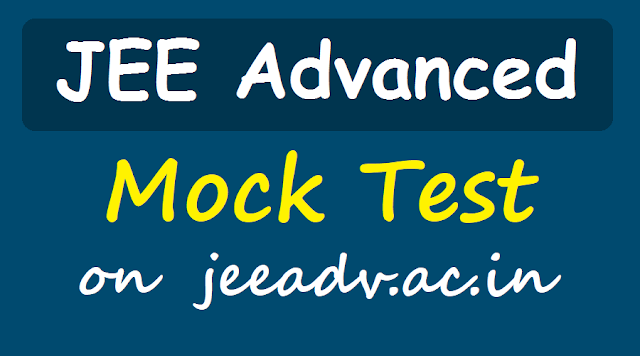 The mock test 2 and 3 are now available free of cost on the official website jeeadv.ac.in. All the applicants can practice on the computer-based mock test. JEE Advanced 2018 would be conducted on May 20, 2018. Approximately 2,24,000 students would be shortlisted on the basis of their JEE Main 2018 rank to appear in the examination for admissions into the premium engineering institutes – Indian Institutes of Technology, IIT. The JEE Advanced entrance examination would be a completely computer-based test this year. The changes in the examination pattern is not sudden as JEE Main (the qualifying examination) is also conducted in computer-based test format. However, there is anxiety within the students as to the CBT pattern. The mock tests and help videos released on the official website is to familiarise the students with the format. Mock Test 2 was released on January 30 and Mock Test 3 on February 1. While a lot of coaching classes provide mock test, all the students preparing for JEE Main 2108 are advised to attempt the Mock Tests released by IIT Kanpur for JEE Advanced. They are free, accessible and would give students a better understanding of the entire examination pattern. These mock tests would continue to be available online till the examination in May. Candidates interested in seeking admissions to the IITs are required to clear the JEE Advanced which is conducted by the 8 regional IITs by turn. In 2018, the JEE Advanced would be conducted by IIT Kanpur. Also, the notice released earlier this year confirmed that JEE Advanced 2018 would be entirely a computer-based test. To facilitate the students and help them understand the computer-based test, a mock test has also been released. All candidates are advised to note that the registrations for JEE Advanced 2018 would start in the month of May 2018 after the declaration of JEE Main 2018 results. Interested students are required to fill the online application forms for JEE Main 2018. Only the candidates who qualify the JEE Main 2018 would be eligible to apply for JEE Advanced. In 2018, about 2,24,000 candidates would be qualified and shortlisted for appearing in the JEE Advanced 2018. The JEE (Advanced) 2018 will be held on Sunday, May 20, 2018. The entire JEE (Advanced) 2018 Examination will be conducted in fully computer based test mode. The Joint Entrance Examination (Advanced) 2018 will be conducted by the IITs . The performance of a candidate in this examination will form the basis for admission to the Bachelor’s, Integrated Master’s and Dual Degree programs (entry at the 10+2 level) in all the IITs. The decisions of the JAB 2018 will be final in all matters related to JEE (Advanced) 2018 and admission to IITs. Examination will be held on May 20, 2018. The entire JEE (Advanced) 2018 Examination will be conducted in fully computer based test mode. The exam consists of two papers, Paper 1 and Paper 2, each of three hours' duration, and will be held in two sessions. Both the papers are compulsory.